Opened on February 5, 1922, the large Forest Hills Theatre is located around the corner from the more famous (and still operating) Midway Theatre in the Queens, New York neighborhood of Forest Hills. After seven decades of showing movies, the theater was sold, along with the Midway Theatre, by United Artists to a local developer in 1998. On August 28, 1999, the Duane Reade opened, with the theatre’s facade restored. The original building beyond the facade was demolished for construction of the drugstore. The project was given a local design award — ostensibly for the meticulously preserved exterior. The interior, however, is now part of Forest Hills' history. I meant if anyone else remembers seeing the Time Machine at the Forest Hills Theatre. I don’t have the time right now to check newspaper ads from 1960. Does the lobby part of the building exist, or just the exterior facade? You can click the thumbnails to enlarge the photos, and view them in a low, medium, high resolution, or original (maximum) resolution, as well as download them for future reference. If anyone can contribute any vintage photos or ads to this photoset, I will be happy to give you credit. All images help preserve the spirit of the former Forest Hills Theatre, and may contribute to other great preservation projects. Let’s be proactive! 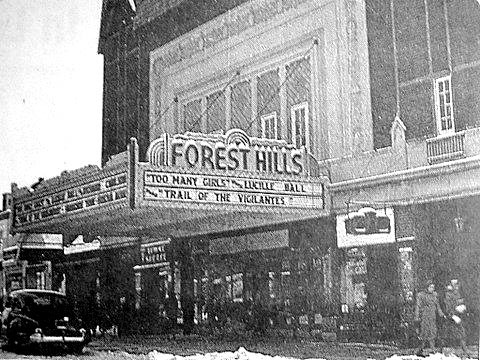 This photo of the Forest Hills is dated 1940, which the titles on the marquee bear out. Thanks to Tinseltoes, who introduced me to this website (for The New York City Organ Project) by linking out to pictures on other theater pages. Thanks for posting, kurt. I remember seeing Radio Days here during your time as manager. A few years earlier, I did see a more conventional (and sort of goofy) fantasy/adventure flick here called The Beastmaster. Last movie I caught here was Trainspotting, upstairs in the summer of 1996. I miss this theater. Enjoyed watching films in both auditoriums, but really liked the raked seating of the balcony room. I saw Blade Runner here in 1982. The biggest problem with this theater, as with the Midway, was parking. Buffalo Wild Wings, the popular barbecue chain, is slated to open a massive location at the former Forest Hills Theatre soon. The new location, at 107-16 71st Ave. — between Austin Street and Queens Boulevard — will measure around 10,000 square feet, which is about 40 percent larger than a typical Buffalo Wild Wings restaurant, said James Bitzonis, president of Four M Capital, LLC, the group launching the restaurant. The restaurant will not interfere with the building’s classic features, Bitzonis said, and it “will pay homage to the theater and Forest Hills” by displaying memorabilia, including photos and jerseys representing local sports teams. The company is in the process of receiving a number of historical photos showing the building and the neighborhood. “We are enlarging them and framing them,” he said. Overall, there will be about 100 pieces of memorabilia displayed at the restaurant. The scheduled opening is July 15. I think only the facade remains? Wasn’t the entire theater destroyed and the building rebuilt? Was even the lobby retained?